This post is sponsored by GNC Earth Genius, however, I’m sharing my own thoughts. All opinions are my own.The US Food and Drug Administration has not evaluated the statements in this post. These products and statements are not intended to diagnose, treat, cure or prevent any disease. GNC recently came out with their own new comprehensive, wholesome line of products called Earth Genius. 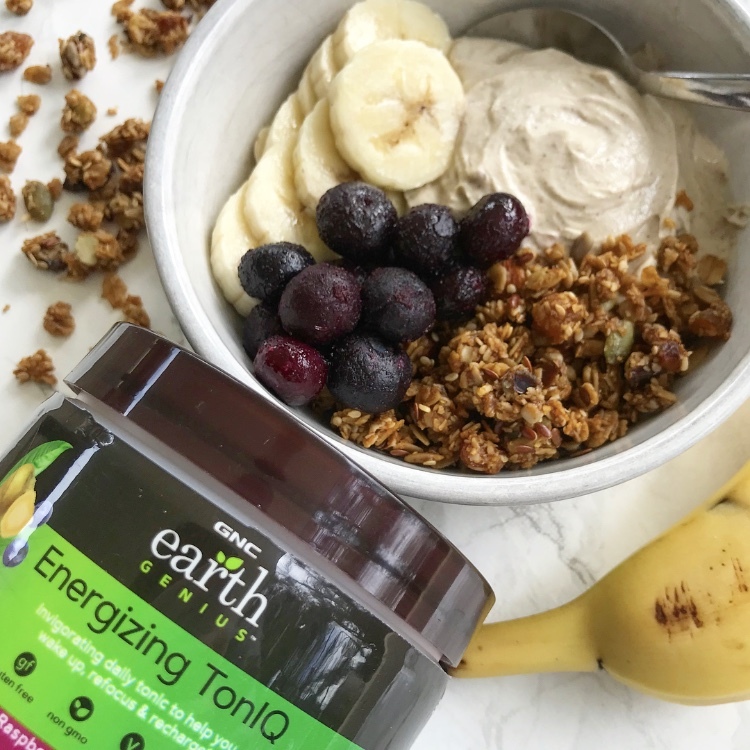 If you haven’t seen my previous post about Earth Genius and my experience with their Superfoods Supreme powder, you can find out more here. I have to say that I’ve been loving the Superfoods Supreme so much that I decided I needed to give some of their other products a try. They have a broad range of products to fit whatever health need you may have, so I decided to look into a few more deeply before deciding which to try next. There’s the Energizing TonIQ, an invigorating tonic that’s designed to help you wake up, refocus, and take on your day. It uses a natural source of caffeine from green coffee bean extract versus the synthetic caffeine found in many other dietary supplements. The Core Slimming Greens are specifically designed to help you reach your diet goals. It’s packed with fruits, veggies, greens, and a special all natural and caffeine-free herbal blend called Slimvance® which has been proven to increase weight loss and waist and hip reduction^. ^ A randomized clinical study of 140 healthy overweight people compared the use of Slimvance® in conjunction with an 1800 calorie diet and walking plan to a placebo with the same diet and walking plan. Those on Slimvance® lost almost 10 more pounds (-11.81 pounds vs. -1.91 pounds), lost over an inch more around the hips (-1.76 inches vs. -0.48 inches) and lost over an inch more around the waist (-2.12 inches vs. -0.68 inches) than the placebo group after 16 weeks. The Beauty TonIQ is a tonic that is meant to protect and improve your skin tone thanks to Sicilian blood orange extracts. It also contains marine-based collagen to support healthy skin structure. Finally, there’s the Calming TonIQ, a tonic that promotes a sense of calm and relaxation. It is enhanced with adaptogenic mushrooms and Suntheanine L-Theanine. They are all super easy to incorporate into your everyday life. You can just add a scoop to water and enjoy since they come in delicious flavors like cucumber melon, mixed berry, lemon cucumber mint, and raspberry green tea. You can also easily blend them into a smoothie, mix them into plain yogurt or oatmeal, or find other fun ways to play around and incorporate them into recipes (be on the lookout for one from me coming to Instagram soon). I decided the Calming TonIQ was the way to go for me, as I’ve been having trouble relaxing at the end of the day and ultimately falling asleep. Like all of Earth Genius’ products, its non-GMO and gluten free with no artificial colors, flavors, or sweeteners. It comes in a lemon cucumber mint flavor which is delicious just mixed into water. I started drinking some an hour or so before I was ready to start winding down for the night, and it has definitely helped me to decompress, relax, and just feel at ease before calling it a night. It’s definitely worth giving a try if you’re like me and struggle with relaxing and winding down at the end of the day. Do you want to try Earth Genius for yourself? You can find their products at your local GNC or online. Make sure to use the code 34126 now through 12/31/18 by showing the store manager in store. You can also use this link http://bit.ly/_StacyEG and enter the code 34126 at checkout if you’d like to order online. Let me know what products you try and how you like them in the comments below!